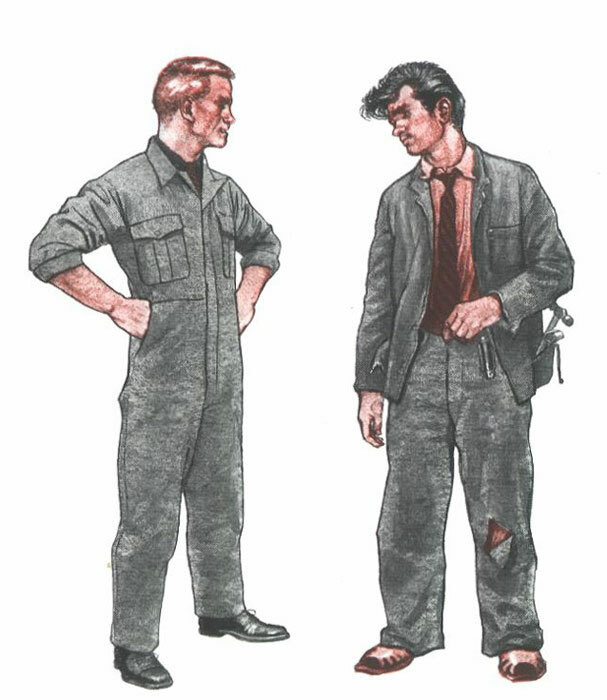 The man on the right is much more likely than his tidier mate to get hurt in a busy railway works. How many danger spots can you find in his dress? "Never wear loose-fitting or torn clothing when operating any kind of machine. If you are wearing a jacket, keep the front of it buttoned up or fastened securely and the cuffs fastened around your wrists. If you wear a tie, see that it is well tucked into your coat or overalls. Don't leave such things as pocket knives dangling from your belt. Wear sensible shoes. Failure to observe these simple rules often results in a serious accident."